For many Limerick, Limericks and poetry are difficult to separate. For some, the Limerick may have been their introduction to poetry, for others they never moved beyond the fun of the Limerick to enjoy the breadth of opportunity offered by poetry. It is widely thought that Edward Lear invented the Limerick, although this is probably incorrect. The Limerick as a form was popularised by Edward Lear in his first Book of Nonsense (1846) and a later work, More Nonsense, Pictures, Rhymes, Botany, etc. (1872). Lear wrote 212 Limericks, mostly considered nonsense literature. The humour is not in the punch line ending but rather in the tension between meaning and the lack of meaning. Whose grandmother threatened to burn her. and said ‘Granny, burn that! Its genesis owed much to Lear. And this split haunts its later career. But in Limerick, it is said the five-line verse probably originated from the Limerick-makers of Croom, known as the Maigue poets, who worked in the 18th century. They were school-teachers, priests and self-styled persons of letters, living within 30 km of Croom. Their gatherings and revels in pubs and inns were said to resemble the ancient Irish bardic schools, conducted in Greek, Latin and Irish. To make my good customers merry. I tell you that, I, your friend, Andy. This has been a favourite haunt of bankers, lawyers, artists and musicians. Jack Charlton, Jim Kemmy, Frank McCourt and Richard Harris are all said to have had a pint here. For a long time the bar and its management prided themselves on the fact that this was one of the few pubs in Limerick not to have a TV, focusing instead on poetry and acoustic music nights, promoting local writers and singers. The pub is known for its artistic and cultural heritage. The White House poetry nights have featured poets from all over the world, and the pub has always been supportive of actors, writers and musicians. The pub was bought in 1999 for the equivalent of €1 million. But the poetry nights continued, and in 2015 the White House celebrated a cultural milestone in marking 600 consecutive poetry nights. When the White House was bought last year by the former Munster and Ireland rugby player Damien Varley, reportedly for €650,000, a Facebook page was set up to save the pub from being turned into a sports bar. The White House is a prominent building at the corner of O’Connell Street and Glentworth Street. It was designed to address both streetscapes in a formal architectural manner. The late 19th century shopfront and the Victorian pub interior make this building one of architectural importance. The roof is concealed behind a parapet wall. Red brick walls laid in Flemish bond with cement repointing. A gantry crane on the side elevation may be original and was probably used to hoist goods to and from the basement level. A plaque erected by Limerick Civic Trust on the left-hand side of the O’Connell Street façade was unveiled by President Michael D Higgins on 24 February 2015 as a tribute to the Limerick-born poet Desmond O’Grady (1935-2014), who began reading his poetry at the White House Bar in 1954 as part of the Poetry Circle. When Desmond O’Grady died at the age of 78 in 2014, President Michael D Higgins led the tributes, describing him as one of Ireland’s best-known poets, who was deeply committed to his work. With the exception of Yeats, he was arguably the most international of 20th century Irish poets. His first book, Chords and Orchestrations, was published in 1956. He was the author of almost 20 books of poetry, including My Alexandria (2006), On My Way (2006), The Road Taken: Poems 1956-1996 and The Wandering Celt (2001). He also published over a dozen collections of translated poetry, among them Trawling Tradition 1954-1994, Selected Poems of CP Cavafy, The Song of Songs, Ten Modern Arab Poets, and Kurdish Poems of Love and Liberty. His other works include prose memoirs of his literary acquaintances and friends. Desmond O’Grady was born in Limerick in August 1935, and spent much of his childhood in West Clare and the Irish-speaking districts of Co Kerry. After boarding school in Roscrea, Co Tipperary, he moved to Paris in the 1950s and worked in the Shakespeare and Company bookshop, so closely associated with James Joyce and the publication of Ulysses. He went on to teach in Paris, and there he became friends with Jean-Paul Sartre, Simone de Beauvoir, Pablo Picasso, and Samuel Beckett, who had recently published Waiting for Godot. When he married an exiled Iraqi Catholic, they moved to Rome, where O’Grady taught English and was the English-language voice of Pope Pius XII on Vatican Radio. In Rome, he also met Federico Fellini and played the role of an Irish poet in Fellini’s La Dolce Vita. For some years, he was secretary to the American poet Ezra Pound in his exile in Italy. When he and his wife separated, he went to teach at Harvard, where he also completed his MA and PhD in Celtic Languages and Literatures and Comparative Studies. At Harvard, he became friends with Robert Lowell, and continued the links he had forged in Europe with the Beat writers Kerouac and Ginsberg. O’Grady also worked as the European editor of The Transatlantic Review. He returned to his spiritual home on mainland Europe, and from Europe, he went to Egypt. While was absorbing, distilling, and writing, he was teaching at the American University in Cairo, where he was Poet in Residence, and at the University of Alexandria. When he returned to live in Ireland, he settled in Kinsale, Co Cork, where he lived for the last 20 years of his life. We met soon after his return to Ireland, and had a lengthy discussion about the Greek poet CP Cavafy, who was born in Alexandria. Over 20 years ago, in ‘An Irishman’s Diary’ in The Irish Times in 1996, I wondered why little attention had been given to his translation of 33 of Cavafy’s poems. This version of 33 Cavafy poems, Alternative Manners, was published in 1993 by the Hellenic Society (Athens and Alexandria). Unfortunately, much to his regret, the proofs were never properly corrected, and so the book was never put on the market commercially and has never been reviewed in newspapers. 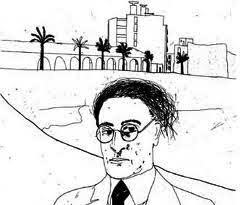 That hope was realised in 1998, when the Dedalus Press in Dublin published Selected Poems of CP Cavafy, a volume that was reissued in 2012, two years before he died. Desmond O’Grady was unusual among Irish poets of his generation for both his interest in modernist experimentation and his immersion in the poetry of other cultures. He was, in the true sense, a citizen of world poetry. always. Arrival there is your final goal. voyaging. Never expect Ithaka to give you anything. Ithaka gave you the journey.